Functional Medicine is the practice or treatment that focuses on optimal functioning of the body and its organs, usually involving systems of holistic or alternative medicine. 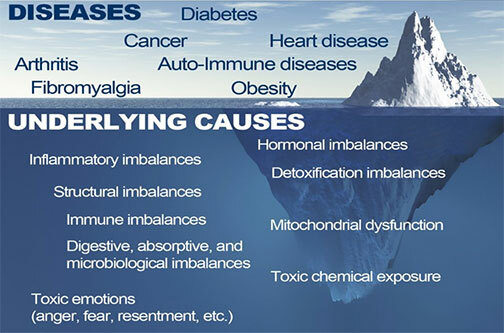 This field looks to find the root cause or mechanism involved with underlying dysfunction and/or an imbalance of bodily systems such as loss of function, symptoms, or diseases. Using scientific principles, advanced diagnostic testing and treatments, Functional Medicine practitioners try to restore balance in the body's primary physiological processes. Remove what is impeding the body from optimally functioning. Ex: Gluten/Dairy. The patient is being treated wholly, not just for their symptoms. We want to educate our patients about their condition so that they take charge of their health and feel empowered. "The good physician treats the disease; the great physician treats the patient who has the disease" - Sir William Osler, pioneer of Functional Medicine."